Mains Powerfeed Systems for Overhead Cranes and Electric Hoists effeciently manage cables and transmit mains power to the hoist or crane. These are systems that transport power along the to the hoist and also provide cable management solutions to avoid any accidental bunching, snagging or breakage of the cables. Cranes-UK offer high quality Festoon Systems, Cable Reeling Drums and Conductor Systems for all types of Overhead Cranes, KBK Cranes, Jib Cranes and Electric Hoists for effective power supply cable management. For more information on our range of Powerfeed Systems for cranes, simply contact our friendly sales team who will be happy to assist you with your requirements and provide a no obligation quotation with suprisingly low prices! Industrial Cable Reeling Drums from Metreel are manufactured to the highest quality and designed to prevent 'lock-out' such as the Mercury range which features a robust cast iron construction which is protected with a special baked polyester powder painted finish to ensure a long life-span, each unit can be supplied with or without a cable. Up to 15.2m lengths can be fitted to our basic range of Cable Reeling Drums which are often combined with some of our Cranes and Hoists. Cranes-UK are able to offer units designed for various applications such as outdoor use and units for use in extreme conditions. 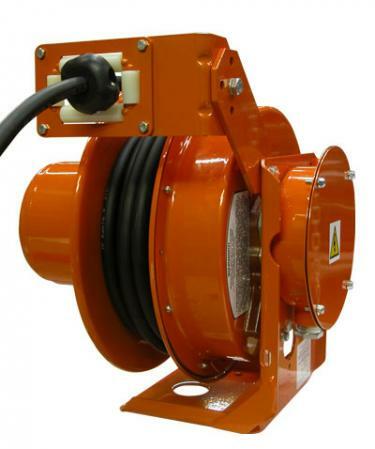 Cable Reeling Drums are a safe method of power and control supply to hoists, cranes, and other machinery and can be used in many applications where other methods are not suitable such as conductor bar systems. Standard models offer 4 cores however we can offer up to 36 core on a 800m travelling distance. 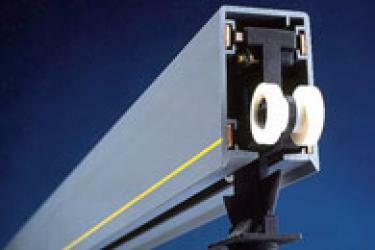 Conductor Bar Systems are usually made up of a plastic bar that insulates a conductive material- normally copper strips. Inside the system also runs a trolley which enables contact between the copper strips and the electrical cable to power the connect crane or hoist, the trolley runs along the track inside the conductor bar so to run along side the crane or hoist as it travels. Our range of Conductor Bar Systems are designed to be low maintenance due to the PVC construction and ability to minimise brush wear and lower the amount of carbon deposits present. Maximum power transmission is achieved by positioning the bushes within the PVC housing, the contact with the flat copper conductors is maintained by the pressure of springs. The design of the Conductor System ensures positive contact and power transmission at all times. Innovative design permits expansion without affecting the operation of the system. High travel speeds and extremely long lengths are what set our conductor systems apart from the rest. Complemented by rugged design that features high mechanical strengths the Conductor Bar also featues a self extinguishing system in the housing materials for safety purposes. The Conductor System that Cranes-UK offer is competatively priced, for more information contact our sales team who will be happy to assist you with your requirements and provide a quotation. Cranes-UK offer indsutrial Festoon Cable Management Systems from Yale and Metreel, manufactured to the highest quality our Festoon Systems carry the power cables required to power machines, cranes and hoists. Choose between traditional enclosed track systems, wire systems and even "I" Beam Festoon Systems. Our systems are availiable as a kit or fully assembled with single or multiple cables, flatform or roundform with track capacities up to 1,000kg for seriously large and heavy cables up to a size of 200x60mm. 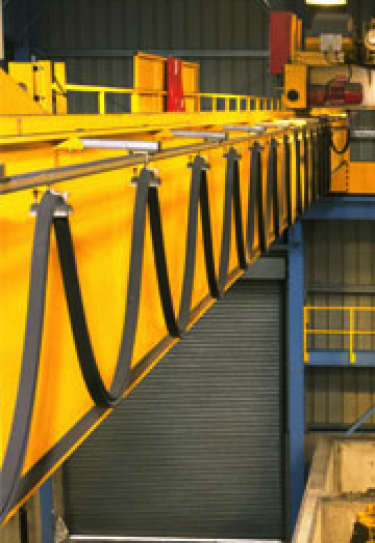 We offer fully customisable straight or curved tracks with the option of proffessional installation to your existing crane, beam, hoist or machine. Our ability goes beyond the supply of standard Festoon Systems, we are able to supply stainless steel models, waterproof models, special finishes and systems designed for use in explosive or hazardous enviroments such as the Nuclear or Gas industry.